A cuddly leopard with a green afro has been unveiled as the mascot of the 2010 World Cup in South Africa. The character, called Zakumi, has been given his own biography and name to reflect the country's aims and hopes. Organisers said the character was 'born' on 16 June, 1994 - the year in which apartheid ended. The date is celebrated as Youth Day to mark the 1976 Soweto uprising when young protesters struck a blow against white rule. 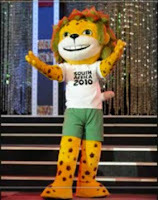 At the mascot's introduction at a state TV studio, a performer in a Zakumi costume kicked around a football with Mark Fish, who helped lead South Africa to the African Cup of Nations title in 1996. The first two letters of Zakumi are the country's initials in Afrikaans - one of South Africa's 11 official languages. 'Kumi' means 10 - for the year of the tournament - in many African languages.